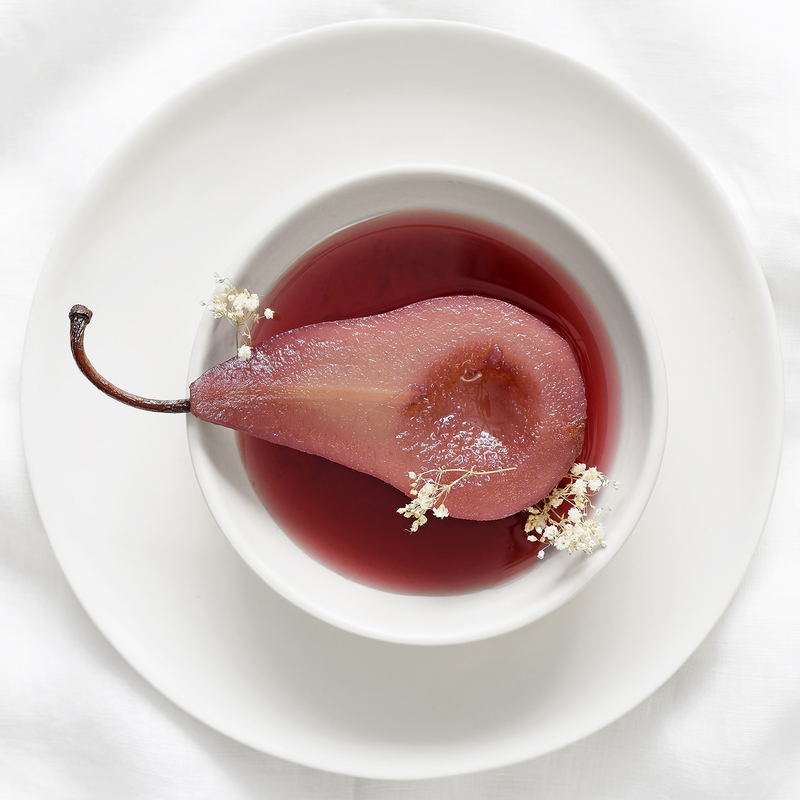 Bosc pears poached in a raspberry and red wine consomme. -Place the raspberries, sugar, and wine in a double boiler covered with plastic wrap, and keep over low heat for 45 mins to an hour. -Look for pale collapsed looking raspberries. You want to be sure all of the juices have been extracted from the berries. -Strain through a fine mesh strainer and set aside the juices. -Peel the pears and then cut them in half lengthwise, remove the cores with a spoon, and place in a medium sized pot with all of the other ingredients. -Cut a circular piece of parchment paper to fit inside the pot, on top of the pears and their liquid. Push the paper down on top of the pears. Poke 3 or 4 holes in the top of the paper with a sharp knife to allow some steam to escape. This will help them cook evenly and consistently. -Bring the liquid up to a boil and reduce the heat to a low simmer. Cook over a low simmer for about 45 minutes, maybe longer. The time will vary depending on how soft or firm your pears are, and your stove temp. Cook for 20 minutes and then check the pears every 10-12 minutes thereafter. -When the pears have some ‘give’ to them when squeezed from the sides: they’re ready to remove. -Take the pears out of the liquid and cool both the pears and the liquid separately. When both are cooled down to room temperature place the pears back in the liquid, squirt in a little lime juice to tang it up, and keep in the fridge for up to one week. -To serve the pears as a dessert: whip the cream with the icing sugar, rose water, and spice until firm peaks form. -Dip a spoon in very hot water, shake off the excess water and form a quenelle of the cream by drawing the spoon towards yourself through the mixture. -Place one half pear in each serving dish, pour in a little poaching liquid, and top each with a quenelle of cream. This looks so delicious…..sweet without being heavy! Cooked pears are such a favorite. These are elegant. A very visually stunning dessert and of course perfect for Valentines Day…. Ha! I hadn’t thought of that! Thanks for pointing it out, and thanks for stopping by! Gorgeous photographs! 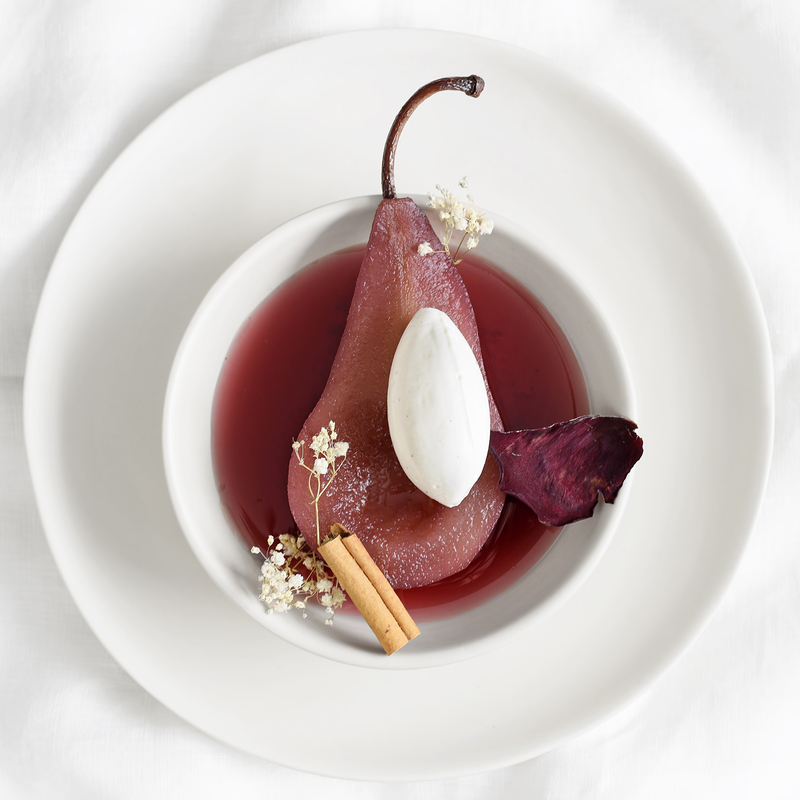 I love poached pears, will have to try this recipe! Wow. Wow. Wow. Gorgeous photo.